That feeling of push-pull that the City of Angels evokes, drawing you in even as it makes you want to hop on a plane to somewhere else, is probably older than Raymond Chandler and is blissfully unaffected by the city’s constant reinvention and its quarterly reports. Still, money never sleeps—with California’s $330 million a year incentive set to expire after the 2019-2020 fiscal year, Mayor Garcetti made news over summer by vowing to push the legislature to increase the figure to $500 million. The state tax credit is currently set at 20 percent, with the former lottery system for applicants scrapped in favor of a jobs-created metric. Producers are also eligible for another five percent if they relocate a series (Fox’s devil drama Lucifer is an example, having relocated from Vancouver in 2017 along with Legion), shoot on location outside the L.A. zone, or do their scoring and/or VFX in state. L.A.’s immeasurably rich film history also serves as a guarantor that among each new generation of moviemakers there will be some, like Paul Thomas Anderson, Michael Mann, and Kathryn Bigelow, who want to tell specifically L.A stories, and are willing to jump through whatever hoops exist to film their stories in Hollywood. A current example may be Karyn Kusama, whose most recent film, 2015’s The Invitation, spun a tale of extreme insularity and decadence in the Hollywood Hills. Her forthcoming film, which began shooting in L.A. in the fall, is a Nicole Kidman-starring detective thriller, Destroyer. The siren call of La La Land to moviemakers is in no danger of fading out any time soon. 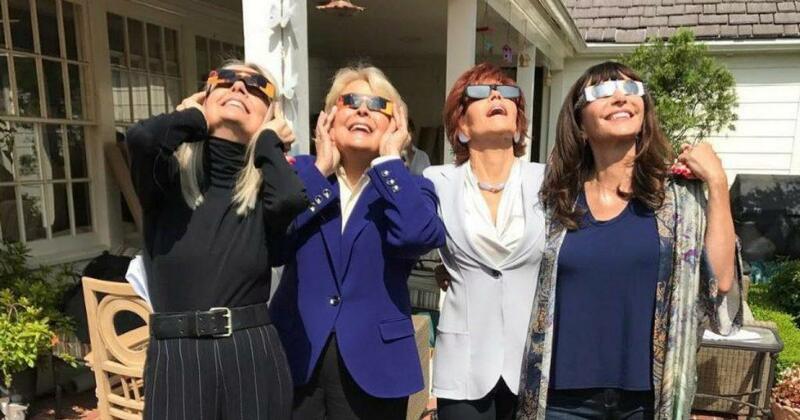 Diane Keaton, Candice Bergen, Jane Fonda, and Mary Steenburgen viewing the eclipse from the L.A. set of the upcoming film Book Club. Photograph by Candice Bergen.